As the Police Trailer and its future in the parking lot of the popular OB Pier is a big issue for a good number of people in Ocean Beach (see our current poll in the sidebar), we thought we’d remove some layers of the ol’ proverbial onion by adding some complexities that surround the trailer issue. and those who want to remove it ASAP. If we examine each of these positions, we’ll find each has strengths and each has basic contradictions that somehow need to be resolved for each to become the dominant one. For the brief background on the situation (see my report of the OB Planning Board decision on the trailer here), the trailer was installed in 1999 to create a stronger police presence in the parking lot as an agreement between the police and OB merchants; it has been funded ever since by the OB Mainstreet Association. There was some initial opposition in the community, primarily based on it obstructing views and taking up parking spaces, as well as a more philosophical stance that the police trailer was symbolic of a creeping “Big-Brotherism”. With the Police Department having closed its storefront office on Newport Avenue earlier in that decade, the push for the trailer succeeded, and it was set up in the parking lot. Merchants believe that police “response time” is critical, and by having cops in the trailer provides a close site for them to rest and write up reports, and cuts their response time. And importantly, they provide a presence in the “seedy” area of OB, near the pier and surrounding beaches and cliffs. Ever since, the trailer provides desks and restrooms for police officers, and the trailer itself obtains electricity and water via resources in the parking lot. At times, the restrooms have broken down, forcing officers to go elsewhere. However, there is some doubt as to just how much time the trailer is used by officers, that it is utilized by police – and perhaps by other city staff – for its restrooms only. As it is not staffed on a consistent basis, people cannot seek police assistance at the trailer. The trailer was originally parked as a “temporary” structure and no one ever obtained any permits from the California Coastal Commission – as people didn’t think it was needed. Yet, fourteen years later, the weathered, gray-blue building is universally judged as an “eyesore”, and cannot be thought any longer as “temporary”; now the Coastal Commission has issued a Notice of Violation to the City. The City is responding by having the Police Department file for a Coastal development permit to make it permanent. 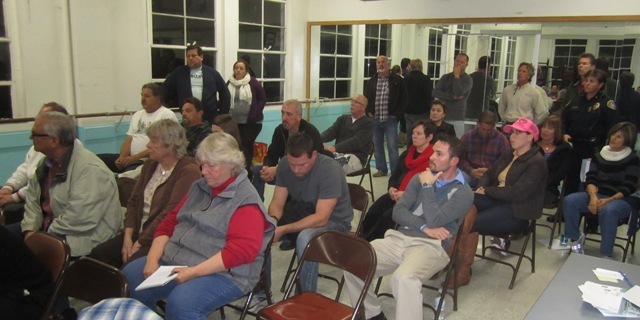 The issue was presented to the OB Planning Board on the night of January 2nd, and they basically split the baby in a confusing vote by both voting to support the application for a permanent trailer at the current location but also voicing their wish to see it in a different location. The Police, the City, and OB merchants want to ensure the trailer remains in its present location. Thus, the move to apply for a permanent permit with the Coastal Commission. OB’s establishment has come out in full support of this position -including the OB Mainstreet Association, leaders at the OB Town Council and OB Community Development Corporation. There have been pledges by all involved to give the trailer a new paint job, a new curtain surrounding its bottom edges, and a large Police Department seal. And the costs of the application for the permit – $5000 to $8,000 – are being handled by the City. Yet, the primary contradiction in this position, is that a trailer, by its very nature, is only a temporary structure. Indeed, how can a temporary trailer be a permanent structure? The application is for a development permit that requires a permanent location for a specific structure – neither can be granted to any other location or structure. That is, if the permit is granted, it cannot later be handed over to a different structure at the same location or to the same structure at a different location. And more, the current condition of the trailer is very problematic. It has sat there for 14 years without any major rehab or improvements. The restrooms require emptying – they are not connected to the sewer system – and at times, apparently, they have become blocked and not usable. This has forced officers to retreat to Western Division or another police facility in the Midway area for breaks, adding crucial minutes to any response time if and when called. Who will pay for any upgrade? The City? The merchants? Why should the City spend valuable resources on a temporary building for just a few people, when the community has been asking for new public restrooms, a new lifeguard station, – and now a combined lifeguard station and police sub-station? But the trailer does need to be fixed up, sometime, somehow, and by somebody if it is to remain. Over the last few years, and especially under the reign of Mayor Sanders, the number of police officers have been cut back, in general and for the beach areas, – and now the new mayor, Bob Filner, has pledged to make police and fire departments some of his main concerns. Yet, there is a huge uncertainty over whether police officers are even allowed to use the trailer – except for restroom breaks. One OB Planning Board member, at least, claims he has never seen anyone enter or exit the trailer. Is it being used? This definitely needs to be clarified. Just who is using the trailer – and how much are they using it? It’s one thing to proceed for the permit if indeed the trailer is being used – even on a part-time basis. It’s quite another to spend the money and effort to comply with the Coastal Commission if no one is actually using it. If the trailer is not being utilized – then outside of taking up space – it simply acts as a much needed “deterrent” – so say some merchants. Both businesses and police claim that the trailer in its current location does deter crime, and that crime has been lower around the area of the parking lot, that because of the trailer, there is less vagrancy, less public drunkenness, and less illegal drug activity. This is the fall-back position for those who defend the trailer against those who claim the trailer is not being staffed by cops or anyone from the city. There are many OBceans who may support this position. The belief by the businesses that the trailer needs to be in the parking lot is not necessarily shared by renters and property owners throughout OB – especially those who would like to see more police presence in their part of the village. This was reflected at the OB Planning Board meeting the other night. There are plenty of folks who are not convinced that it needs to be located in that exact position. There are ideas to move it to under the Pier or over to Robb Field. Advocates say that either location has the needed power and water. Police representatives, however, respond by saying that under the Pier would make the trailer more vulnerable – that people could then easily get on top of it or throw things on it – such as lit flares. Plus, it would be difficult for the pump truck to maneuver over to empty the trailer’s restrooms. The Robb Field location, say police, lacks the necessary utilities needed for the trailer. The police response to the idea of the trailer being under the Pier lacks substance; the trailer is needed in the parking lot due to the crime under the Pier, but the trailer cannot be moved under the Pier because of all the crime or potential crime there. This is a circular argument … unless the trailer is indeed not staffed at all. So if people climb on or throw things on the trailer, there is no one there to respond. The claim by police that there are inadequate utility facilities at Robb Field doesn’t add up either. There is plenty of electricity and water throughout that large park area. There is plenty of space, as well. One local noted that the police even have a storage area at Robb Field that has the utilities needed – but this has not been confirmed. But what the Robb Field location does not offer is easy access by police to where the merchants consider the worst area of OB: in and around and under the Pier. No third location for the trailer has emerged for folks to consider. With property values – even in a recession – what they are at the beach, who or what can give up property for the trailer – even a police trailer? What About the Coastal Commission Violation? What this Position No. 2 does not deal with, however, is the violation cited by the Coastal Commission. The City is being forced to deal with it – the merchants and their association certainly don’t have the resources. No one else does either. And neither does this position. Sure, keep the trailer there at the parking lot on a temporary basis – the status quo – but we want it moved when a better location is found. The Coastal Commission? Whoops! The OB Planning Board tried to take this position of support for a temporary place but also came out in support of the development permit with the Coastal Commission. Yet, again, the Coastal permit would be only for a specific structure at a specific location and address. The third major position in the community is to remove the trailer – and do it now. These advocates cite the obstruction of public and private views by the trailer, the taking of public space in the form of needed parking spaces, that aesthetically, the trailer is an eyesore – which sends the wrong message to tourists and law-abiding residents. Tourists, especially – those with this position say – see the trailer as an ugly, bad mark on the community. One of the strengths of this position, however, is grounded in the perception that the trailer simply is not being used by police – or anyone else in the City. So, until this is clarified by the City and by the Police Department, these skeptics will thrive. Another reason for skeptics to feel negative about the trailer is the fact that citizens, residents, tourists – cannot approach police officers at the trailer – if they are in fact in it – if in need of police assistance. There is no regular schedule attached to the trailer door, for instance, outlining staff times and hours. So, there is an ugly eyesore taking up needed space that is blocking views and is not providing any services to the community. This sums it up. In addition, there was – since its inception – opposition in the community against the trailer as it represented a sense of “creeping Big-Brother” – an unwarranted intrusion into the public space by uniformed agents of the larger conservative San Diego establishment. A decade ago, some OB activists fliered the neighborhood and Farmers’ Market in attempts to galvanize a larger opposition based on those perceptions. Whatever the success back then by these activists, neither they nor their view materialized at the OB Planning Board meeting on the trailer. This third position also fails to deal with the sense among many OBceans lately that more police officers are needed in the community. This is probably due to the rash of violent and sexual assaults that have plagued OB since the Summer months. There have been several reported incidents of knife and other violent fights in front of bars or under the Pier, of women being sexually assaulted late at night as they walk home. But the complexities of this are heightened when people realize or perceive that despite the trailer these assaults took place – and that the trailer did nothing to deter or prevent these types of assaults and crimes. What to Do? Police Sub-Station in New Life Guard Station? Cops Walk Their Beats? There are no easy answers – and we are certainly not trying to provide one – simply outlining the problems of each major position within the community on this issue of the future of the police trailer. One long-term answer, though, is to have constructed a new Life Guard station that includes public restrooms – and a new police sub-station. OBceans and their community organizations ought to begin lobbying the City right now for this new facility – much needed at our waterfront. The present lifeguard station is woefully inadequate – built in the mid-Sixties – a half century ago; it contains the worst public restrooms in the City at the beach. And despite its age, we’ve heard that police officers will actually use the restrooms within the lifeguard station – the ones the lifeguards use. More permanent structures for police are needed. This was hinted at during the OB Planning Board meeting last week. A representative of the Life Guard union pleaded with the Board to “look for the larger picture”, and that there “are too many trailers everywhere” – in criticizing the City in not having permanent facilities for its first responders like police officers and lifeguards. On a practical basis, this is where the City should be spending its money – a new lifeguard station with police sub-station – if the City budget and direction are willing. The merchants need to be protected and enabled to feel secure in the business district of the community. Residents need to also feel that police are paying attention to their blocks perhaps far removed from the Newport Avenue area. More police officers are needed – but it would be wonderful to enact the old “community-policing” techniques and have the officers get out of their patrol cars and actually walk their beats, and get to know people in the community. The neighborhood needs cops who know us, who’ve been here for more than six months, who know the in’s and out’s, and who can counteract the understandable hysteria of victims with reassurance and patient police work that can solve assault crimes. Whatever position predominates in OB over the future of the police trailer, there are wrinkles within all of them that need to be answered or resolved before the village can move ahead. 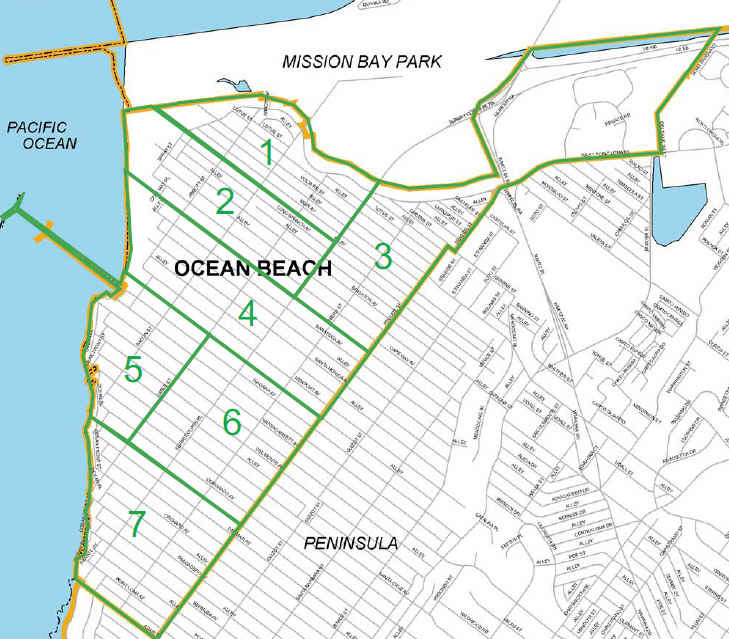 We hope this peeling back of the onion has muddled the waters of those who see things in black and white (no pun on police patrol cars intended) – allowing all of us to appreciate the nuances and subtleties of working together to preserve the best of Ocean Beach. When the trailer was installed it had an S.D.P.D. sign , it was taken down during one of the many times it was moved for concerts in the parking lot. The sign was full of graffiti and police did not use the trailer, therefore no sign was needed. As soon as the O.B.M.A. got wind of the trailer being illegal they started asking officers to use it, a couple of officers with rank started to use it, your average beat cop cannot use the trailer except for the restroom. that’s just a big fat lie. During late summer police cannot see the lock on the container due to darkness and they struggle to open it, perhaps locating the trailer in that area could provide lighting for the container as well.The trailer would not occupy any parking spaces or block a view, and it would have a direct sewer connection. It is less than one mile from it’s current location. If and when you do see a police officer go into the trailer, please don’t bother them they are there to use the restroom, that’s why the door is locked, that’s why you do not have access for disabled. Big brother will always be in the parking lot, a new police camera was installed on the light pole next to the trailer, supposedly it was to deter crime & vandalism ? we now have three police cameras looking at the pier parking lot, to do what ? Yesterday at around 7:30 pm there was around 25-30 people gathered at the wall IN FRONT OF THE TRAILER ! drinking alcohol and smoking , the trailer didn’t call the police , all the cameras didn’t help or call the police, I did, police arrived in less than five minutes, the wall was empty in fifteen minutes and one person went to jail. Police respond quickly almost every time. You will also see police walk along the tide pools on a more frequent basis, this is a result of citizens calling and asking them to do so. News 10 ran the story also see http://www.10news.com/news/coastal-commission-permit-must-be-obtained-for-police-trailer-to-stay-in-ocean-beach-parking-lot-01082013. If OBMA and the majority of the merchants feel the police need office space then someone should offer up some space “like a good neighbor”. Come on merchants, someone store a few bikes for our police force and use it as a tax write off. Why does the OB community have to settle for an ugly ocean front trailer in it’s community? Why didn’t the city think ahead and instead of building a $1 Million dollar artistic bathroom just put in the basic concrete block with a small storage area for police bikes and equipment? Hello!!!! Is anyone thinking here? Would such a trailer fly in LaJolla? If there is so much crime in this area that needs immediate response the police can sit in their car in the parking lot and wait. Their visable presence in the lot would make them accessible to the public and be a crime buster. BYW…who owns the parking lot? I don’t think the trailer would last 24 hours at La Jolla Shores. Did you hear Denny Knox say they don’t have a problem moving the trailer in that report ? Really ? then why has this taken five years and a violation notice to the city from the coastal commission ? where has she been ? this whole process is because the O.B.M.A. refuses to move the trailer even 100 yards under the pier !, WTF is she talking about ? I love how people think the beach bathroom cost so much more because it was “artistic”. As if a different configuration of cinder blocks and a sticker on the ceiling cost an extra $500k or whatever. Next time, we should just dig a big hole and let people poop on the ground like cavemen, lol. So the design added no cost??????? If the cost per sq. ft. is acceptable to you, maybe you have unlimted funds in your bank account. But the cost to build that bathroom was outrageous and unwarranted. Seth, you are in a position on the OBPB to look out for the publics’ best interest. The OBPB should have raised havoc over the cost of that bathroom. OB should of had three for the price one. Sometimes you just have to fight for what’s right. Well, didn’t mean to be so snarky. As someone who was on the OBPB for that project but is not anymore, I think it was a pretty favorable outcome overall. Definitely seem to have been some issues with the bid process, but that’s a pretty nice building. A prominent, high-use public facility that should have a lifespan of 50-60 years. The cost issue is way overstated. There was a pretty marginal cost increase over just throwing up a replica of the old brick sh-thouse that was in that spot. Probably talking like 10%, not 300%. Just not going to be the same cost per sqft on a public facility as compared to a private project. That’s its own discussion, but no excuse for a neighborhood that generates so much revenue for the city to be using porta-potties for another 3 years. I’m a pretty thrifty guy, but in the scheme of things, that building is hardly that extravagant. Here is a suggestion I did not see listed in the poll. If they want a presence in OB as a deterrent to crime I can think of a better spot than a trailer in the middle of a parking lot just off the beach. How about getting the permits to add another level on top of the lifeguard house where the restrooms and showers are and put it there. It would have a better view for them and of them all over the beach and nearby streets and this would truly be a permanent structure. Throw some cameras on top and it would certainly be a crime deterrent. Keeping a small trailer in the middle of a parking lot just seems like a half sassed idea to me. In response to GEORGE M……….Please run for office…..
Great idea and well thought out. I hope someone hears you. The trailer should have Never been allowed there. It’s an eyesore, takes up space, no one really uses it, and just looks bad. I really do not believe it is in any way a deterrent to crime at all. Criminals see it and think so what… there is no one there anyway. They don’t care. It looks so ridiculous. They don’t care. I remember when it got placed there too. Such a sad day. It looks so bad too, from the hotel, the Pier, the alley view. When sandcastles used to be there at Christmas, it was in the way as well. It certainly does not allow for nice photographs anywhere in the area due to it’s size and being in the way. Yuk. The sea wall and whole pier area are a total OB disgrace. Scary and dirty, filthy. Double yuk. So really, the trailer there has not helped. They do not care. Alcohol helps the not caring process. I can’t really believe it has been allowed to stay as long as it has. Who? really believes it is a “crime” deterent? Not us. Crime still happens all the time, everywhere. Alley cats everywhere stealing all the bottles,cans and plastics from the blue cans on an hourly basis. Driving a better vehicle than me! Same people every day too. Just read Crimemapping.com and walk around and just notice stuff. Hoodlums abound in OB. They litter and write graffiti as well. They don’t care. They spit, throw cig butts down and trash too. They don’t care. They do not care if an empty trailer is there or not. Just like over by the Red Lobster restaurant, there is an empty neighborhood police station. No one is there except for reports. The door is always locked to the public. they don’t care. Put the trailer, if you have to have it, over by the Life guard station…Next to the park and the soon to be built new condos! They will be safe there. Just saying. Not sure of the accuracy of the “poll” either. I feel that there needs to be another more accurate poll. They don’t care, but I do. I think you do too, George. Geat idea. I hope they Hear you.Or read it.